Wow, what a world has opened up to me since I took an interest in Balsamic Vinegar! Balsamic Vinegar has a fascinating history and is growing in popularity every day. I never paid much attention to Balsamic Vinegar (living an hour from Napa keeps the focus on wine) until one day I had lunch at a restaurant that served a very special Balsamic Vinegar with their bread and oil. I had never tasted anything like it! I was hooked, I wanted to know more about the variety of flavors that I had been missing, as a result, this site was born. I hope you find it helpful and interesting. Please comment freely, I look forward to hearing about your favorite Balsamic Vinegars too! Probably the most common of all balsamic vinegar is the standard, everyday, or 1 Leaf rated. This has a sharper more pronounced vinegar flavor and is the least expensive of all the balsamic vinegars. What are the best uses for this everyday balsamic? One very nice use of an everyday balsamic is to use it to add flavor and interest to various types of soup especially Minestrone. It should be stirred in right before serving. One of the most common uses is to make a balsamic vinaigrette. Here is a quick and easy recipe. Blend ingredients in a blender for a thicker vinaigrette dressing. This should make enough for 6 to 8 servings of mixed green salad. Refrigerate and store in a covered container. Whisk or shake well before serving. Adding balsamic vinegar to Mayonnaise creates a flavorful condiment that makes a great addition to sandwiches and can really add a splash of flavor to tuna as well. Here is how you can make a simple balsamic reduction. Put your balsamic in a saucepan, bring to a simmer, turn heat to low and reduce until slightly syrupy. Some like to add ingredients such as honey, brown sugar, garlic or other seasonings to make this a delicious addition to many meats and vegetables. What about just adding it to Olive Oil for dipping or drizzling over vegetables and cheeses? For those uses I really recommend a higher grade of balsamic vinegar. 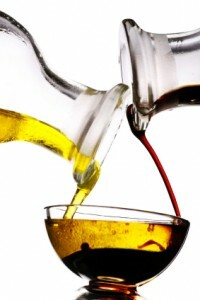 See our balsamic vinegar ratings section for some guidelines. Usually everyday balsamic vinegars have a much more pronounced vinegar flavor that can overpower foods when added directly to them. Have fun exploring the many uses of everyday Balsamic Vinegar!